One of the ways the Australian Bureau of Statistics looks at household finances is to measure average household debt as a percentage of average household income. Over time, it shows whether households are becoming more or less indebted in relation to their earnings. To picture how it works, imagine that your household’s annual disposable income is a big, tasty pie and that your total debt represents a slice of it. How big is the slice? 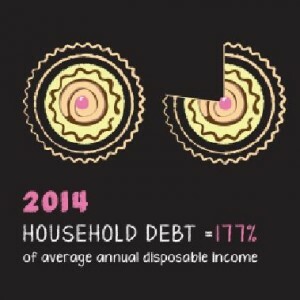 For the average Aussie household, the slice of debt is actually bigger than the pie! How did that happen? Back in the 1970s, total average household debt was just 30 percent of annual disposable income. Since the mid-1990s, however, household debt has exploded, eating up a bigger and bigger share of the income pie. By 2002, average household debt exceeded annual disposable income, which meant one pie was no longer enough. Today, in 2014, it has reached a whopping 177 percent. No wonder so many households are feeling the pinch. So, who’s to blame? It’s widely believed that loose lending standards in the 1990s are responsible for triggering a rapid increase in the number of people taking out mortgages and home equity loans. In turn, this contributed to skyrocketing house prices, which continue to weigh heavily on household debt. Credit card debt and personal loans are other significant contributors. The good news, however, is that Australians are starting to save again. Since the global financial crisis, Aussies are jumping back on the saving band wagon and trying to reduce debt. Would you like to reduce your slice of the debt pie and start saving? MyBudget can help. We’re Australia’s largest, trusted personal budgeting specialist since 1999.